Exhibitor optimism and demand for space raise hopes for a breakout boat show week. Sea trials will be offered at the show&apos;s Sea Isle Marina venue. Marine industry players are pretty much unanimous when it comes to February’s Miami boat shows — you can’t miss them. 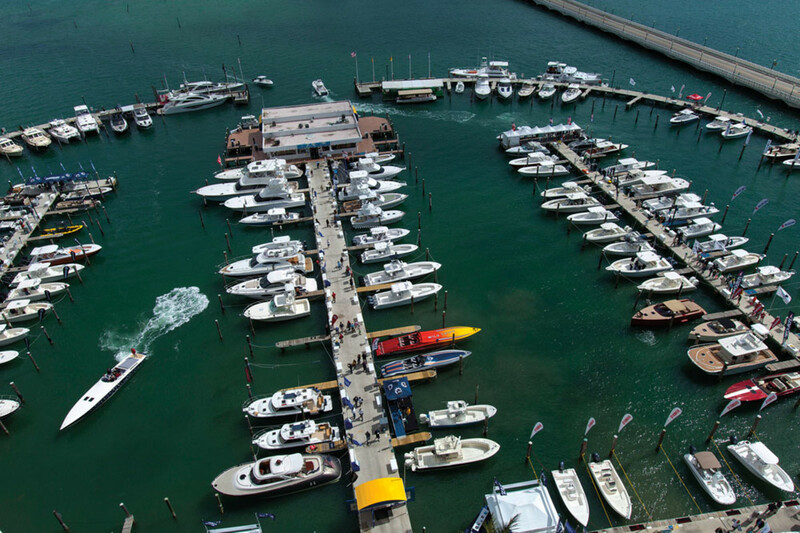 The Progressive Insurance Miami International Boat Show, which runs concurrently with the Yacht & Brokerage Show in Miami Beach Feb. 13-17, is an institution in the city of Miami and for the overall boating industry. 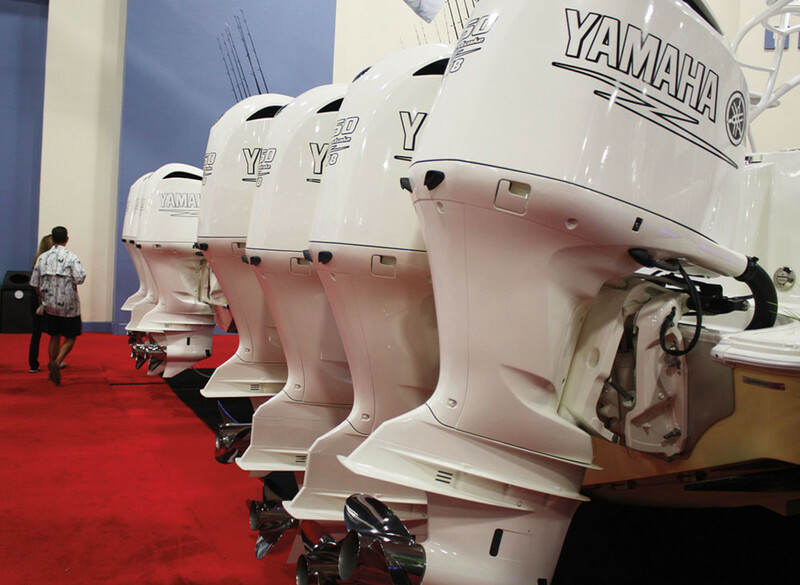 More than 2,000 companies showcased 3,000-plus boats at the 2013 show and attendance was up 1 percent from 2012, to 102,118. The figure includes attendance at the Strictly Sail portion of the show, which was 19,742, up 17 percent from the previous year. “We feel very optimistic. All the indicators are right now that we should have a very good boat show season and a positive spring,” says Shelley Tubaugh, who directs sales and marketing for Grady-White Boats. The North Carolina builder will bring products that include the company’s 251 Coastal Explorer, which Tubaugh says is a whole new category of boat, and the Freedom 335, the company’s largest dual console. Carver will have three new yachts at its indoor display at the convention center: the C34 Command Bridge and C40 Command Bridge and the C37 Coupe. All three have been introduced within the past 12 months, and the C37 Coupe is making its international debut at the show. The C40 made its retail debut in the fall at the 2013 Fort Lauderdale International Boat Show. The company says all three have innovative new hull designs, spacious and private staterooms and fiberglass stall showers. Their interior layouts are based on an integrated design that combines the swim platform, cockpit, salon and galley into a single living environment. Even boatbuilders who do not regard Miami as a primary target market say the shows are useful. They provide opportunities to attend key industry meetings and for exhibitors to meet with their South and Central American dealers, plus an international venue to put new models on display. Rob Parmentier, president and CEO of the Larson Boat Group, says the company’s Striper brand has the most market penetration in Miami, but the pontoon market is showing some promise there and he is working with show management to display the company’s new Escape in the convention center lobby. A fiberglass-aluminum hybrid pontoon that was unveiled last July, the Escape comes in 21-, 23- and 25-foot lengths. 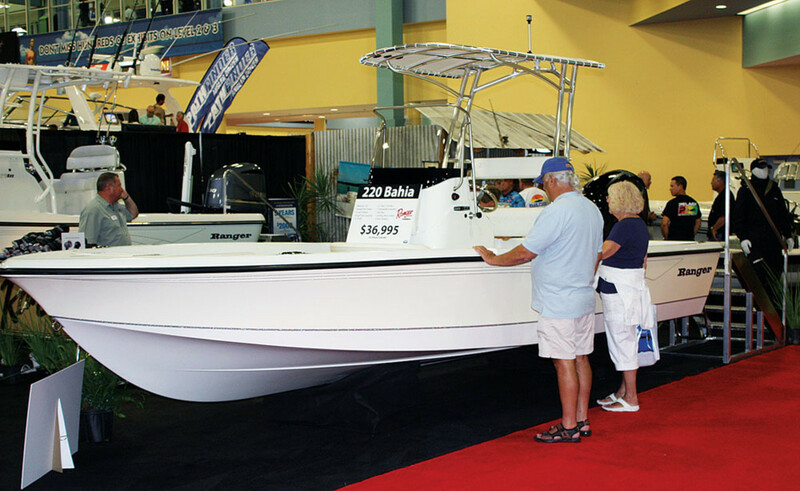 A couple checks out a Ranger Bahia at last year&apos;s show. The group will bring several Larsons, putting one with Axius power in the water at Sea Isle Marina so show-goers can sea-trial the boat. Of the three locations, the largest is the convention center, which has 2.5 million square feet of exhibition space that uses 1 million square feet of carpet, enough to cover 20 football fields, says show manager Cathy Rick-Joule. The New Yacht and Power Show at Sea Isle Marina showcases hundreds of boats in the water and is the site of hands-on classes presented by the Recreational Powerboating Association, as well as demo rides by various manufacturers. 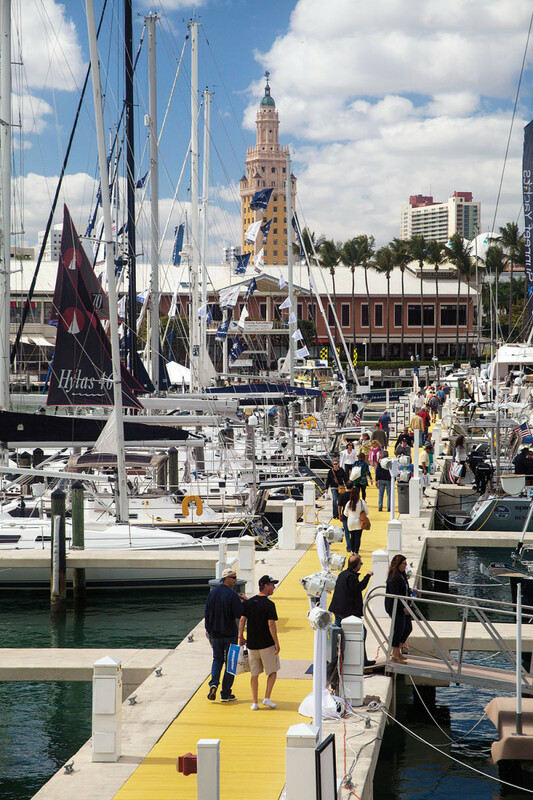 The third location, Strictly Sail Miami at Miamarina at Bayside, features sailboats and sailing accessories, live music and free sailboat rides. The show also has grown its international presence this year, Rick-Joule says. The British Marine Federation, Australian Marine Industry Association and at least 20 companies from China will have a presence. The International Buyers Program, launched last year with the U.S. Department of Commerce, is now working with 20 countries to draw buyers to the Miami show, Rick-Joule says, nearly quadruple the number from last year, when the outreach involved six countries. The program seeks to match buyers with manufacturers, as well as secure hotel rooms at a particular rate and make the overall experience smooth for non-natives. “Buyers come in and register, and we partner them up with manufacturers and decision-makers at the show,” she says. Last year the program reached out to buyers in Japan, Turkey, Chile, Panama, Costa Rica and Brazil. This year the outreach will include all of those countries except Chile, plus Argentina, Canada, China, Colombia, Finland, Germany, Mexico, the Netherlands, Russia, Spain, South Africa, South Korea, Thailand, the United Arab Emirates and Ukraine. The Scarab was brought out of virtual retirement as a brand for the company’s entry into the jetboat market and has secured space. Glastron jets also were introduced during the past few months. The company will bring the 195 and 215 HO Scarab models, as well as the Glastron 187 and 207, all recent models with jet propulsion. Robalo now has space inside the convention center and in the expanded outside area, Lane says. “We will split our sales opportunities between the two booths, and ultimately as the grandfather clause kicks in more for Robalo, we’ll move that space inside. But we have to start somewhere,” he says, adding that all of the new Chaparral and Robalo models will be displayed — the Chaparral H2O 21 and the 307 SSX and the Robalo 206 Cayman and R222. In addition to increasing the international presence at Miami, the NMMA is trying to strengthen its relationship with the superyacht segment. NMMA president Thom Dammrich, Rick-Joule and export development director Julie Balzano attended the 2013 Monaco Yacht Show in September to increase the U.S. organization’s visibility and develop relationships with the superyacht segment. Superyacht Lifestyle Miami will be a new event at the 2015 show, and it will be previewed this year. Although the NMMA initially scheduled the new event for this year’s show, the trade group said launching it so quickly was too lofty a goal. Instead the NMMA will host the preview event at the 2014 show to give attendees a “flavor” of the event, Rick-Joule says. The Strictly Sail Miami portion of the show takes place at Miamarina at Bayside. The Sea Isle location allows engine manufacturers to partner with boatbuilders so attendees can sea-trial boats, an important element at the Miami show, Rick-Joule says. The area also is used to hold Discover Boating classes. Baldree says the thing that makes Miami unique is that builders have already participated in a significant number of winter shows by the time this one rolls around, so they have a good idea of production levels and the buyer’s mood around the country. “What we find in Miami is, you get a little more of an indication of, is there a comeback in some of the bigger models over 35 feet? We’re seeing a little bit of interest in that segment, and we think Miami is a good bellwether for those bigger models,” Baldree says. This article originally appeared in the February 2014 issue.